This makes two consecutive monsters in my Draw Something series! 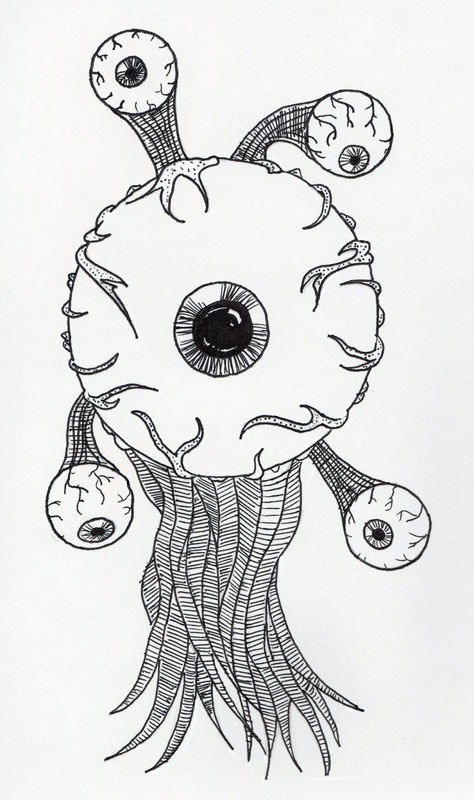 Not sure where I got the inspiration for this, but I had the sudden urge to sketch a giant eyeball. Oddly, the tedious, sinewy nerves were the most fun part to draw. I'm quite proud of the overall result! How To Make Fake Blood! The Origin of the Hook Man Urban Legend. The Difference Between Horror and Gore Movies. The Diner At The Edge Of Town. Fun Ways To Celebrate The First Day Of Fall! The Triumph Of The Rock Lords! The Item At The Bottom Of The List. The Secret Behind Tarot Cards. 23andMe DNA Test Results: Health Edition. Sleepovers, Monopoly And The Dark. The Terror of Count Duckula! I Think My Blog Is Haunted. Creepy Videos From The Internet!